I don't know about you, but I think I look much different than I really do. Not necessarily better or worse, but different: a little more sketchy; a little more linear; a little more in medias res. In pictures, I seem so concrete; so prosaic. Sometimes, I see myself as, like, the shadow of a moving cloud, but I'm really just . . . gravitized. I wonder if pictures in which we like the way we look are the ones that reflect who we really are, as we instinctually know ourselves to be, or if those pictures are a lie, a trick of angles and light, that we want to believe. A person looks in a mirror thinks, That's me. Is it? Is the mirror-gazer comprehending the whole picture or just looking at his face; his arms; his feet? Dr.Wayne Dyer once asked an audience to point to themselves. They all pointed to their chests. He asked why they didn't point to their heads. A damned good question. 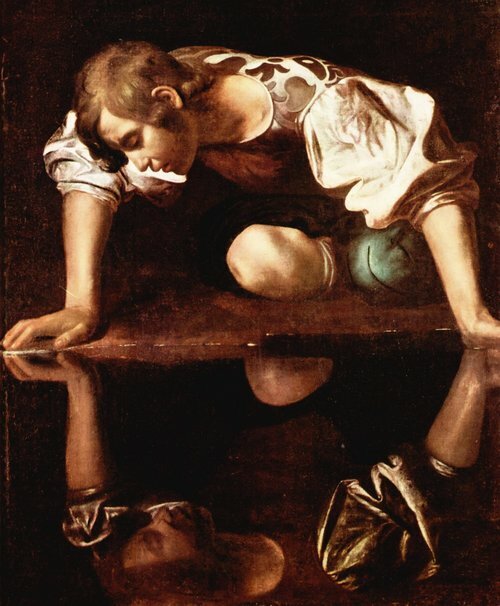 Was Narcissus really in love with his own image or was he intrigued by the way the rippling water distorted it and kept comprehension just out of reach? Isn't it fascinating how we get the impression, when looking into someone's eyes, that we are seeing into them. "Windows to the soul," or windows to the mind? Well, if you point to your chest . . .
Why is it so hard to lock eyes with someone? Maybe because the intimacy of knowing -- of seeing inside -- is too much for us. Have you ever looked into your own eyes in the mirror? Is it too much for you? So many things get in the way of our figuring out who we really are -- really seeing ourselves -- but that is our most important task on Earth, isn't it? Without that understanding of ourselves, what does the rest really mean? What if I spend my life thinking I need juicy steaks to be happy only to find out (or worse, to never find out) I like fish better? There I'll stand, with a freezer full of dissatisfaction, no matter how you fillet it. Somehow, we all have to figure out a way to step through the mirror, enter the soul, and shine some torchlight on the truth. Come to think of it, maybe the mirror isn't the doorway after all. Maybe it's an only an impenetrable illusion of access. Maybe we're already in and don't take the time to notice. Just saw "The Matrix", did we? It's all perception and reality. What is and what should never be. I like the ideas you're floating out there, but I think it should all be considered with care. Worry too long about which side of the coin we are dealing with and there is a danger of losing touch, albeit slight, with connections we've made. Nobody wants to hang with a guy staring into a mirror in his freezer while paralyzed by the choice between fish and steak. I agree -- which is why we should figure it out before it comes to that . . . I don't see it as a Matrix thing, though. I see it as an "I'll get to it later" thing. "Nobody wants to hang with a guy staring into a mirror in his freezer while paralyzed by the choice between fish and steak." Ha ha!!! -"I wonder if pictures in which we like the way we look are the ones that reflect who we really are..." I'm going with illusion; I think pictures we like reflect who we want to be. (Which I suppose begs the question: is it possible you ARE the person you want to be? My insecurity begs to differ, though). The problem with pictures, of course, is that they freeze a moment in time -- and we humans are ever-changing. To "capture" an image in and of itself is against human nature in that sense. -Love the bit about why people don't point to their heads. I would argue that they are not pointing to their chests, but their hearts, however. Which is kinda nice if you stop and think about it. -Finally, as for seeing oneself clearly, truly understanding who we are... I'm not sure I think that's possible to achieve. Quite frankly, I don't think the human mind is up to the task -- too many variables, moving parts; too large a body of work to analyze. Don't get me wrong, I'm a huge believer in the quest for self-knowledge; I just think the mountain has no top. Onward ho! I really like your conclusion. It's hopeful. And sent me along the following thought path (bear with me -- it's a little convoluted): I wonder if perhaps the quest for self-knowledge is in part a manifestation of our frustration with the inherent boundry between ourselves and the outside world? The outside world is so hopelessly complicated that we focus on the inner world as a more familiar and smaller territory to navigate, and one where we have some modicum of control. Are we through the looking glass -- but convince ourselves that by 'realizing our own inner truth' we'll somehow lessen the divide between inside and outside, and make the outer world easier to navigate? Maybe reality is a fun house mirror -- we KNOW who we are, and we are fascinated and confused by the warped image that gets pinged back to us intermittantly, making us second guess the truths we already know. And thus the mirror is a gateway not to the soul, but to the outside world. Sorry for the novel. I hope you continue on with this perception thread. Fascinating stuff. And now it's time to go get a sandwich. No apologies necessary. A "novel" of a respose on this one can only mea my evil scheme has worked . . . mu, hahahaaaah. Awesome points by the way. I think you are dead-opn with the pointing to the chest thing. I believe that is exactly what that Dyer guy said to them afterward. I agree about the mountain having no top as far at the vastness within us, but I do believe there are certain things we can discover about ourselves as a means to find happiness. I think most people don't work hard at figuring this out at all. We creative types know that making stuff is what brings us satisfaction. Somewhere along the line, I once said out loud: "Hey! I'm a communicator. That's what I am!" (The guy next to me on the train got up and moved.) But I realized that what makes me happy is communicating with words and/or music. To limit myself to one was a bad idea. Now, I do find stuff out about myself every day, still, but, at least I have that to work with. What I think is sad is when people don't even try to figure themselves out. I guess the core of all this is a favorite Bradbury quotation of mine: "When people ask me where I get my ideas, I laugh. How strange, we are so busy looking out to find ways and means, we forget to look in." I assign a paper to my studentsd every year when we read Hamlet. I have them figure out their own tragic flaw. Then I say to them: "Imagine if you went through life without ever having identified the one major personality flaw that could lead to your tragic downfall." Still -- how many people do figure it out?